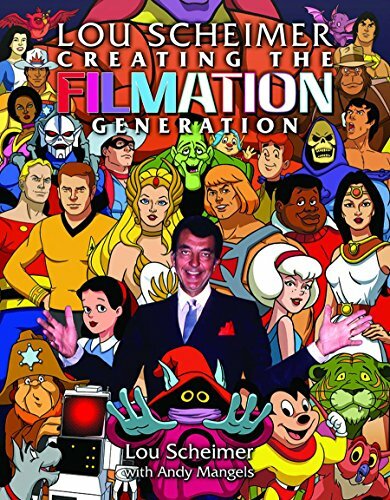 Filled with an amazing string of memories for anyone who has ever watched a cartoon on Saturday morning, Lou Scheimer: Creating the Filmation Generation covers well over 40 years in the history of animation. This is a detailed and colorful chapter in the history of television as told by someone who honestly shaped what we view. Along the way Mr. Scheimer, working with noted historian and author Andy Mangels, brings to life the story behind such shows as the animated versions of Fat Albert and the Cosby Kids, Star Trek, The Archies, He-Man and the Masters of the Universe, Superman, Batman, Aquaman, Ghostbusters, and dozens of others. There are numerous pieces of original art, stills, an impressive full color section that documents both success and projects that never came to fruition as well as photographs of actors who voiced characters such as Jughead and Superman. But the story of the Filmation Generation is just part of the biography of Mr. Scheimer. Fascinated by comics he would sit patiently for hours redrawing classic work from Prince Valiant as well as dozens of other strips. At an early age he was learning basic skills that would serve him well as an animator. Naturally skilled as an artist, Mr. Scheimer was also driven. Realizing he needed help to go to college, he joined the service with a mind towards going to Art College on the G.I Bill. While in school he tries to figure out where he can find a career in art. The mid fifties were a classic period of reinvention for animation. He is especially taken with films from UPA studios such as Gerald McBoing Boing and cartoons based on the works of James Thurber. These animated short subjects are changing the way animators look at their drawing boards. In many ways the new generation of animators were reacting to the lush beauty of the Disney films such as Dumbo and Fantasia by simplifying their style. It also had the improvisational hints of jazz. As he had when he was drawing newspaper comics in his parents’ store, Mr. Scheimer was naturally gravitating towards the best in the field and learning from them. Moving with his wife to L.A., he eventually picks up jobs at various low budget animation studios. Learning the business from the ground up, washing cells and spends countless hours doing backgrounds. Around 1962 he and a partner decide to form their own studio, Filmation. They have some early success creating animated shows for The Lutheran Church, Bozo the Clown, and others, but it doesn’t last. By 1965 Lou Scheimer’s animation studio is barely three years old. He and his partner Hal Sutherland are the only two remaining employees. Despite the studio’s they are now broke. There are 24 empty desks in the building they are about to be kicked out of. Their receptionist is literally a mannequin. The phone rings and it is Hal who picks it up. The voice on the other side of the phone apparently identified himself as “Superman Weisinger from DC.” Not sure what to do Hal hands the phone to Lou. Thinking this is a joke Lou asks Superman what phone booth he is calling from. Mort Weisinger is the story editor for Superman comics at DC Comics. He says that a young executive from CBS named Fred Silverman thinks he can turn the vast wasteland of Saturday morning television into something profitable for the network. He wants to start with Superman. Weisinger needs an animation studio that can do the work cheap. In the late fifties and into the early sixties the networks had absolutely no idea what to do with Saturday Morning programming. Silverman sees dollar signs and he believes that Superman will help him get them. Weisinger wants to send someone out to visit Filmation. This sets up one of the most classic and funniest Hollywood success stories of all time. The partners immediately begin a very elaborate and well-played ruse worthy of The Sting. Lou eventually tells DC that Filmation is so busy they can only receive visitors one afternoon a week. Even then they only have a one-hour window in order to meet possible clients. . . . With nothing left to loose Lou and Hall scramble to fill their empty space with real animators, friends and workers in order to impress DC’s representative. Eight years later Filmation has seven shows on all three major networks, is making both animated feature films, and is also creating live action programs. At their peek the Studio employs well over four hundred animators. Mr. Scheimer’s story is an important part of the history of television animation. Filmation’s use of limited-style animation may not have been pioneering, that honor would go to the Hanna-Barbera studio, but Mr. Scheimer and his colleagues knew how to adapt that style better than anyone. What Filmation created has become part of the American media landscape. The studio helped revolutionize television programming and animation as an art form. Filmation inspired thousands of artists and sold millions of bowls of cereal. As to the cereal, The Archies’ biggest song was “Sugar, Sugar.”. . . As to the inspiration for other artists, we now have Robot Chicken, Cartoon Network, and a lot of animators who were initially inspired by Filmation. That shows the range of Filmation’s influence, pure pop for now people alive in 1969 and pure parody married to a heartfelt tribute from the generations that followed what Mr. Scheimer helped create.